Born at St. Petersburg, Dec. 23, 1777; died at Taganrog, Dec. 1, 1825. During his reign (1801-25) more measures for internal reform were inaugurated than under any of his predecessors, from the days of Peter the Great (died 1725). He prepared the way for the emancipation of the serfs, and promoted education, agriculture, commerce and manufactures literature and the fine arts. Catherine II. (died 1796) had already exhibited a certain degree of liberality toward the Jews: and when Alexander succeeded to the throne, on the assassination of his father, Paul, in 1801, the liberal—or, rather, radical—disposition of the young ruler and of his advisers soon permeated all departments of the government and extended even to the public at large. Such a liberal spirit could not fail to prove beneficial to the Jews (Orshanski, "Iz Noveishei Istorii Yevreyev v Rossii," in "Yevreiskaya Biblioteka," 1872, ii. 218). 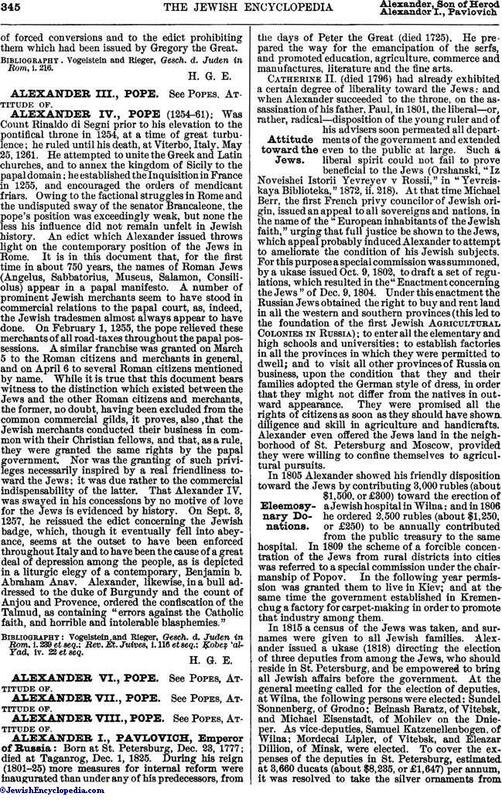 At that time Michael Berr, the first French privy councilor of Jewish origin, issued an appeal to all sovereigns and nations, in the name of the "European inhabitants of the Jewish faith," urging that full justice be shown to the Jews, which appeal probably induced Alexander to attempt to ameliorate the condition of his Jewish subjects. For this purpose a special commission was summoned, by a ukase issued Oct. 9, 1802, to draft a set of regulations, which resulted in the "Enactment concerning the Jews" of Dec. 9, 1804. 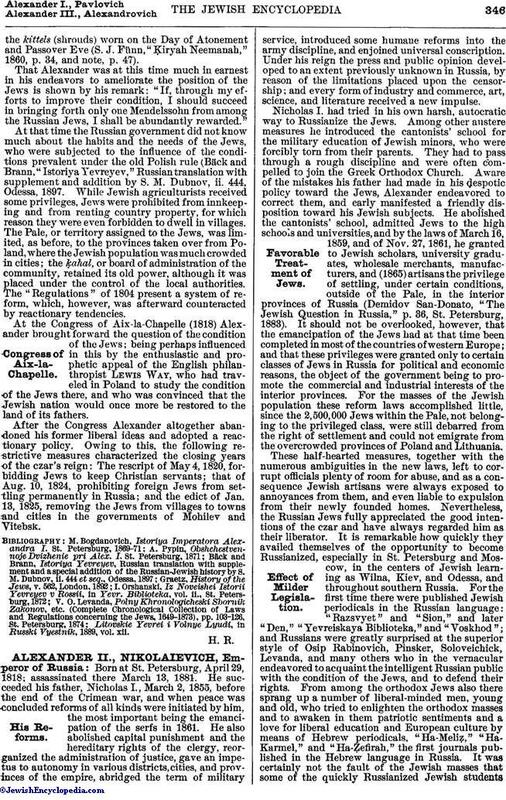 Under this enactment the Russian Jews obtained the right to buy and rent land in all the western and southern provinces (this led to the foundation of the first Jewish Agricultural Colonies in Russia); to enter all the elementary and high schools and universities; to establish factories in all the provinces in which they were permitted to dwell; and to visit all other provinces of Russia on business, upon the condition that they and their families adopted the German style of dress, in order that they might not differ from the natives in outward appearance. They were promised all the rights of citizens as soon as they should have shown diligence and skill in agriculture and handicrafts. Alexander even offered the Jews land in the neighborhood of St. Petersburg and Moscow, provided they were willing to confine themselves to agricultural pursuits. In 1805 Alexander showed his friendly disposition toward the Jews by contributing 3,000 rubles (about $1,500, or £300) toward the erection of a Jewish hospital in Wilna; and in 1806 he ordered 2,500 rubles (about $1,250, or £250) to be annually contributed from the public treasury to the same hospital. In 1809 the scheme of a forcible concentration of the Jews from rural districts into cities was referred to a special commission under the chairmanship of Popov. In the following year permission was granted them to live in Kiev; and at the same time the government established in Kremenchug a factory for carpet-making in order to promote that industry among them. In 1815 a census of the Jews was taken, and surnames were given to all Jewish families. Alexander issued a ukase (1818) directing the election of three deputies from among the Jews, who should reside in St. Petersburg, and be empowered to bring all Jewish affairs before the government. At the general meeting called for the election of deputies, at Wilna, the following persons were elected: Sundel Sonnenberg, of Grodno; Beinash Baratz, of Vitebsk, and Michael Eisenstadt, of Mohilev on the Dnieper. As vice-deputies, Samuel Katzenellenbogen of Wilna; Mordecai Lipler, of Vitebsk, and Eleazar Dillion, of Minsk, were elected. To cover the expenses of the deputies in St. Petersburg, estimated at 3,660 ducats (about $8,235, or £1,647) per annum, it was resolved to take the silver ornaments fromthe kittels (shrouds) worn on the Day of Atonement and Passover Eve (S. J. Fünn, "ḳiryah Neemanah," 1860, p. 34, and note, p. 47). That Alexander was at this time much in earnest in his endeavors to ameliorate the position of the Jews is shown by his remark: "If, through my efforts to improve their condition, I should succeed in bringing forth only one Mendelssohn from among the Russian Jews, I shall be abundantly rewarded." At that time the Russian government did not know much about the habits and the needs of the Jews, who were subjected to the influence of the conditions prevalent under the old Polish rule (Bäck and Brann, "Istoriya Yevreyev," Russian translation with supplement and addition by S. M. Dubnov, ii. 444, Odessa, 1897. While Jewish agriculturists received some privileges, Jews were prohibited from innkeeping and from renting country property, for which reason they were even forbidden to dwell in villages. The Pale, or territory assigned to the Jews, was limited, as before, to the provinces taken over from Poland, where the Jewish population was much crowded in cities; the Ḳahal, or board of administration of the community, retained its old power, although it was placed under the control of the local authorities. The "Regulations" of 1804 present a system of reform, which, however, was afterward counteracted by reactionary tendencies. At the Congress of Aix-la-Chapelle (1818) Alexander brought forward the question of the condition of the Jews; being perhaps influenced in this by the enthusiastic and prophetic appeal of the English philanthropist Lewis Way, who had traveled in Poland to study the condition of the Jews there, and who was convinced that the Jewish nation would once more be restored to the land of its fathers. After the Congress Alexander altogether abandoned his former liberal ideas and adopted a reactionary policy. Owing to this, the following restrictive measures characterized the closing years of the czar's reign: The rescript of May 4, 1820, forbidding Jews to keep Christian servants; that of Aug. 10, 1824, prohibiting foreign Jews from settling permanently in Russia; and the edict of Jan. 13, 1825, removing the Jews from villages to towns and cities in the governments of Mohilev and Vitebsk. Litovskie Yevrei i Volnye Lyudi, in Russki Vyestnik, 1889, vol. xii.